A grotto thought to be the "first live forest in an indoor shopping centre" is to provide new bedding for rhinos. 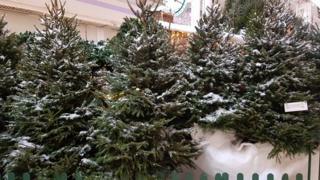 More than 120 trees from the Weston Favell shopping centre in Northampton are being chipped to send to Woburn Safari Park in Bedfordshire. Chris Smart, Woburn head keeper, said they will be used to "make a fragrant and skin-friendly bedding material for our southern white rhino herd". He said the pine also acts "as a natural disinfectant". Woburn has three female and two male southern white rhinos, which are native to southern Africa. About 60 potted Norway Spruce trees from the display are being donated to the local community. Four hundred people have applied for them. Kevin Legg, Weston Favell centre manager, said: "We take our role of being an integral part of the local community seriously and wanted to ensure the trees from our hugely successful grotto were put to good use."